Keeping your young ones entertained in the car can be pretty impossible sometimes, especially on long car journeys. Once you've got completely sick of playing eye spy and your eldest has flattened the battery on your smart phone it's time for a different tactic. 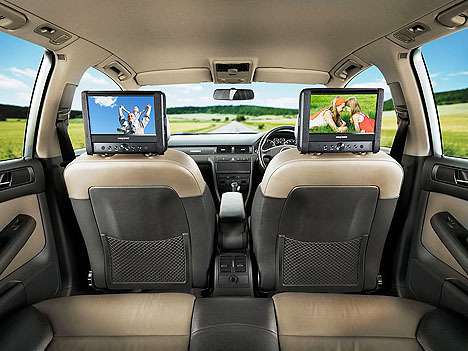 The Next Base SDV49AC twin in-car DVD players avaliable from Halfords are ideal for such occasions because you can either both watch the same film, or, as in our case with children of different ages, two different films. With headphone sockets on both, we elected our eldest to wear hers, whilst our toddler sat glued to the screen, listening to Waybaloo until he fell asleep! The SDV49AC 9" screens are are LED backlight high resolution panels with 800 x 480 RGB true colour pixels, which gives you brilliant picture quality even at wide viewing angle. The thing that I loved about this slim player is that it supports a number of disc and formats including DVD, DVD+R/RW, DVD-R/RW, CD-R/RW, CD Audio, XviD, MPEG4, MP3, DivX, JPEG, JPG, which means you don't have to just ruin your best Disney DVD's. You can not only play your home recorded DVD's, it has a USB and SD slot for playing your movies taken straight from your PC. You can also listen to your favourite stereo MP3 music and even 'rip' CD's to MP3 format, instead of having to go through the rigmarole of starting up your PC. Set up is very easy depending on your car. After charging both units with the supplied mains adapters your ready to put them in the car. The head restraint mounting kit comes with both units and only takes 5 minutes to fit. The rechargable battery last for over 2hrs, but If your going on a long journey, I recommend fitting the 12v power lead (supplied) into the cigarette lighter to keep it fully charged. As I said earlier, the players can either work independently or with an AV cable (supplied) taken from 'master' player to the other so the same film can be watched. Both units also come with headphones and remote controls to keep those little ones happy.